Valdez and Michelle Navarro won bronze. In Wednesday’s opening speed round, the Venezuelan riders had filled four of the top five placings, putting them firmly in the lead with a total of 2.59 faults heading into Thursday’s team competition. 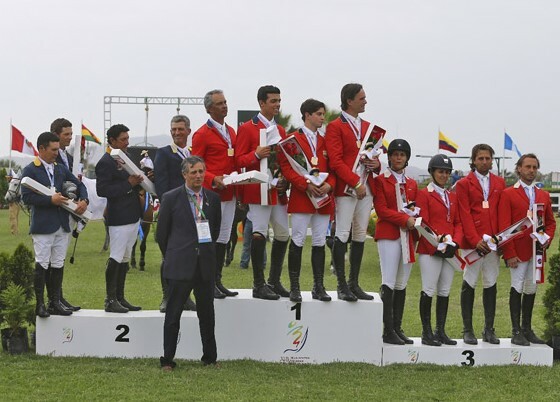 Venezuelan team of Emanuel Andrade, Pablo Barrios, Luis Larrazabal and Andres Rodriguez won gold over Colombia (Fernando Carrasco, Mauricio Guevara, Juan Clavico, and Mark Bluman), with Peru (Maria Paza Castaañeta, Julian Duprat, Alonso Valdez, Michelle Navarro) winning bronze in the team jumping at the Bolivarian Games in Peru. In the two-round Nations’ Cup team competition starting on the Thursday, Luis Larrazabal was the lead-off rider for Venezuela, posting a score of eight faults riding Cosmea 14. This would become their drop score. Pablo Barrios riding Zara Leandra was clear while Emanuel Andrade and Andres Rodriguez each produced scores of four faults each. With a total of eight faults at the end of the first round of the Nations’ Cup, Venezuela remained in the lead with a total of 10.59 faults. With the gold medal within their grasp, Venezuela returned to produce perfect results in the second round. Larrazabal, Barrios, Rodriguez riding Elatrice, and Andrade riding ZZ Top v/h Schaarbroek all jumped the course without penalty, which wins team Venezuela the gold medal. Andrade, who was only 17 years of age in 2013, made his debut on the Venezuelan Show Jumping Team at the Bolivarian Games. With his mount, ZZ Top v/h Schaarbroek, a 12-year-old bay Zangersheide gelding (Zandor Z x Latus I) owned by Hollow Creek Farm, he produced a top five finish in Wednesday’s speed competition before posting impressive scores of four and zero in the Nations’ Cup team competition. The show jumping competition at the Bolivarian Games concluded on Saturday 30 November when the individual medals were decided. Pablo Barrios won the gold medal in the opening speed phase with his teammate Andres Rodriguez winning bronze (Mark Donskoy of Colombia took the silver). Venezuala’s Rodriguez took the gold medal in the second round of the individual jumping competition. Barrios also took the gold medal in the third individual jump competition with his teammate Luis Larrazabal taking silver and Ecuador’s Luis Ignacio Barreiro taking bronze.